Aleron Kong has pioneered a new genre of fantasy. This is something called LitRPG. This was my first foray into the genre and I didn’t even know it existed until after I finished the book and found a whole host of others writing in the same style. LitRPG is, what I presume, short for a literature role playing game. The author takes you into an RPG world of their creation and lets you perch on their shoulder while they ‘play’ this game of literature. This is a shockingly simple concept and I’m pissed that I didn’t think of it. It should be boring but it isn’t. You get sucked in quickly because the rules of the world are familiar to any gamer and therefore inviting. From the first chapter on, it’s like sitting down to a hot meal of comfort food. There’s not a whole lot of kale for your brain within these pages, but who cares if it tastes good. I guess I shouldn’t be surprised that this is successful. I am constantly shocked that my kids spend 20X the time watching other people play video games then they spend watching scripted shows. There’s a reason that Twitch was sold for roughly $1 billion. One billion dollars!!! Watching other people play video games is an absurdly profitable business. 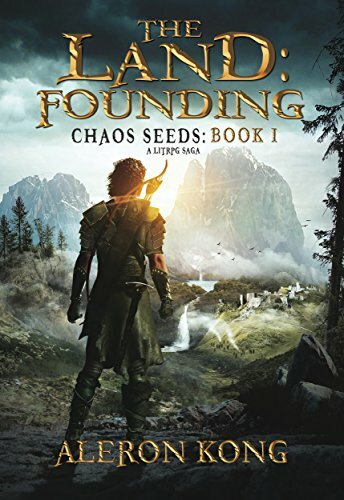 LitRPG is a logical progression that, in hindsight, seemed inevitable. The character development is…analytical. You get to see the literal D&D style character sheet in many different flavors as the character progresses throughout the world. As far as emotional development goes, it’s almost nonexistent. I actually just finished the fifth book in the series, so I obviously can’t judge this too harshly, but there is no emotional growth at all in the main character. He has the emotional intelligence of an unripened kiwi fruit but, for the genre, it works. Our main character is known by his RPG handle, Richter, after the first couple of chapters. I’ve forgotten what his real name is at this point and since we never revisit his past, it becomes irrelevant. This is an area where color could have been added to the character and it feels like a bit of a miss. Does he miss his mom? How about friends or family at home? Unlike Cline’s book, Ready Player One, you are in the game with Richter all the time. Richter has all the complexity of a frat boy that gets to play with a bunch of medieval toys. One of the elements that I loved about the book is Richter is not just leveling himself up. He quickly gains the opportunity to start and level his own town. So now we are combining the elements of RPG with turned based strategy. That was always one of my favorite types of games so it resonated with me. While the character himself is not that complex, the world that Kong builds is rich with detail. The skill trees presented to Richter are satisfyingly deep as are the complexities of the town. Knowing that you are in a game the entire time removes a layer of the suspension of disbelief that I typically look for when I dive into high fantasy. However, knowing the rules before you jump helps create the world for you as you read through it. I didn’t want to like these books as skipping the whole world build part almost seems like cheating. Like I said earlier I’m five books in, so they’re not all bad. Feel free to add the series to your guilty pleasure list.